In our latest interview, we spoke to Anuradha Chawla, Founder of Bbetter HR Solutions. Through her journey so far, She has proved that if you are true to yourself, and have the right mindset, you are bound to succeed no matter how difficult the challenges are. She continues to inspire and empower many women entrepreneurs through her journey. Why did you choose entrepreneurship over a job? I started my career at a very early age and stepped into various jobs for 16 years. Initially, the on-job learning, new domains, authority, obvious benefits like salary & bonuses kept me going and motivated. I am full of gratitude for all my previous employers. But over time, I started to drift away from the corporate culture with its long office hours, no personal life and lack of flexibility. And I thought of taking a break for good. Honestly, I didn’t choose to be an entrepreneur, rather entrepreneurship chose me. While I took a sabbatical, I received training requests from Universities, followed by calls from startup ventures for consultation. I decided to nurture students from universities and guide them to find their dream jobs. I also decided to help entrepreneurs to be successful in their start-up projects. I am not naïve and understood the obvious challenges coming my way. Regardless, I found it a respectful way to utilize my time for a bigger cause. One thing led to another and within a few weeks, I was drafting the “Services” page of my website. What gets you out of bed in the morning, i.e., what’s your source of motivation? My happy team members always keep me on my toes along with my clients who are always expecting more results. The independence to work at any hour, from anywhere and all this flexibility have made work more fun. New ideas pouring in from all corners keep the adrenalin rush at the peak. All the newly-found time at my disposal helps me plan my mornings more creatively. Every morning, I start my day relaxed without any rush of 9 am appointments and enjoy the small joys of life. Sipping hot water while sitting in my balcony, hearing the birds chirping. I make a mind map of my to-dos and the start of my day. Why should people choose your services? People choose Bbetter for the value we bring. When we start working with a new company, our focus is to increase their business by improving their teams and helping them in their reputation building. We have not invested a penny in marketing and by the grace of God, we keep getting new clients by word of mouth itself. We prefer to keep it the same way and focus on increasing our bandwidth and our clientele. What’s your competitive advantage and why shall companies work with you? Our knack for identifying and nurturing leadership by comprehensive training and simultaneously increasing teams by Inorganic growth is our key differentiator. What challenges/obstacles did you face in your journey so far? Lack of enough talent in the Industry is our biggest challenge. However, the opportunity lies in the challenge itself. We need to approach Universities and make the students employable. There are huge requirements for talent with all my clients. They need students who can work on projects or are ready to join their sales and marketing teams. All we need to do is give orientation to these institutes to give the right training to their students. Tell our audience more about your failures? How should one bounce back? We get up every morning to make new mistakes and then learn from them. Failures are only the stepping-stones to success. I have had my lows and moments of self-doubt. After a long period of job, it’s not easy to break the inertia. There were many setbacks including the realization that people I called friends were only colleagues and now ex-colleagues. My phone was not buzzing with their calls like before. But then, there were a few who loved me more than their jobs and stood by me. What comes first for you – money or emotions? It’s always emotions first for me. Our business model is on the emption to “help”. We want to help our clients increase their business through an initial hand-holding in setting up their operations. Right from finding a good space, to naming the business and building an effective team, we shadow our clients on every step. 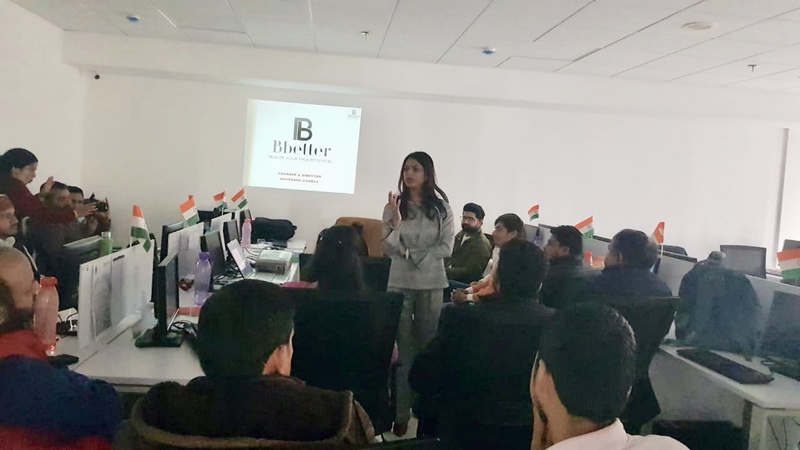 Internally, at Bbetter we employ and empower women who are career-oriented but do not get the opportunity to prove their occupational capabilities because of their family set up and personal obligations. Money is obviously a priority but we believe if our value creation process is right for others, the money will automatically come as an outcome. How do you handle the pressure and manage stress? I believe it’s always good to have a positive pressure but we must take it as a challenge and do better. My gym routine and once in a while hiking/trekking keeps me going for new challenges in life. Gratitude to the divine and immersing myself in meditation always help me during stress or pressure. What advice would you give to aspiring women entrepreneurs and anyone who wants to start out? I believe an early start and belief in ourselves are the two most important advice I would like to give to aspiring entrepreneurs. The hefty pay packages and ego-massaging designations are fatal and can keep us from being what we are meant for. Also, experimenting is equally important. If you fail, do not think twice and jump on to your next idea. Diversify and try all the options you have in your mind. Life is too short to sulk, so go on and keep trying your luck. BrilliantRead is committed to bringing stories from the startup ecosystem, Stories that reshape our perspective, add value to our community and be a constant source of motivation for the whole ecosystems of startups and aspiring individuals.